As well as being organised in a certain way, most choirs sing certain types of music, choose members in certain ways, learn music in certain ways, etc. 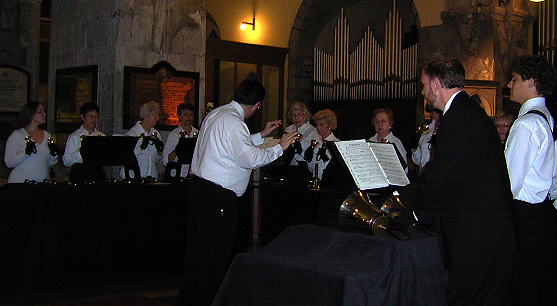 Often choirs are described in terms of the music that they sing. But the style of music doesn't totally define a choir: Almost any combination is possible: there are church-choirs which sing gospel music, and company-choirs that sing classical choral works. The following sections describe how each type of choir often operates. This type of choir typically operates on a very informal basis, or as a class through and adult and community education centre. world music groups may combine singing with other activities eg dance. Usually have a strong emphasis on having fun and community, and not as much emphasis on the meaning of what is being sung or on performance. Learning method: By ear, with no accompaniment, not even using backing tracks or pitch-pipes. Often the starting point is body work and breath control. Part singing: Sometimes, but how this is done varies widely. Performance style: Minimalistic - some of these choirs don't perform at all. This type of choir bridges the gap between a world music / singing for the terrified type of groups and classical choral societies. There is not a hard distinction between the various types - more of a continuum depending on the interest and skills of choir participants or members. Typical repertoire: Songs from your own culture, indigenous cultures in your country, or other influential countries - for English speakers, this usually means the US or UK. These may popular songs, top-10 hits, songs from musicals / music-hall, and some easier classical/choral pieces. Learning method: By ear or from sheet music. Learning CDs are often provided. Sheet music: Often provided, but people who don't read music are welcome too. Part singing: Often - though sometimes only two or thee parts. This type of choir is very similar to a community choir or singing group - though many cathedrals have a church choir that is more like a classical choral society.. Typical repertoire: Hymns and anthems appropriate to the church's theology. May include Gregorian or other chant, folk-music or Contemporary Christian music songs. .
Part singing: Sometimes, depending on they skill of the gtrup. Performance style: All performances are carried out during church services, and expect the singers to lead people in prayer rather than to specifically perform. This type of choir is typically performing at a high level, undertaking challenging works and demanding high standards, with a strong performance focus. Typical repertoire: Music from the classical or contemporary choral repetoire. Many works are religious (masses, requiems, Gloria's, Magnificat's). Generally members need to know and understand what you are singing, but it's fine if you don't believe it. May include choral arrangements of madrigals, popular songs, songs from the opera, musicals / music-hall. Auditions: Almost always. These may be quite demanding for high-quality choirs. Learning method: From sheet music. Rehearsals have an accompanist and learning CDs usually available. Sheet music: Provided. People who don't read music are sometimes welcome, provided they can learn by ear quickly enough. Experience needed: Usually at least some choral singing experience is required before joining a group like this. Performance style: Static - typically standing in position for the duration. Very high standard choirs typically learn materials by heart, but many perform using sheet music. This type of choir is defined purely by the type of music which is sung. Note, though, that in some ethnic communities a "gospel" choir is simply one that sings music based on scriptural content, rather than any particular musical style. Typical repertoire: Music arranged in Gospel sytle. Traditionally this is African-American spirituals, but it may include many other works. Church-based gospel choirs expect members to believe what they are singing, while some others use the words only as a way to focus on the style/sound of the music and don't attach any meaning to them. Learning method: By ear or from sheet music. Sheet music: Usually provided, but people who don't read music are welcome, provided they can learn by ear quickly enough. Experience needed: Sometimes.Usually at least some experience is required. Performance style: Energetic, using rhythm and movement to enhance the feel of the sound. Usually perform without using sheet music. 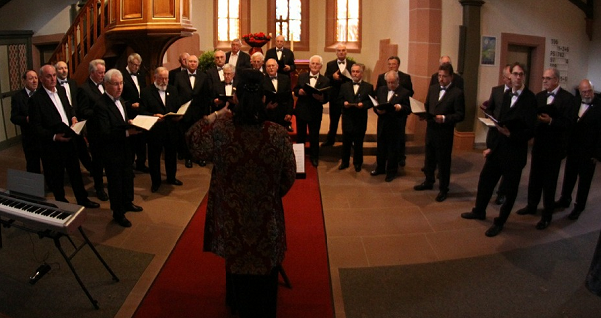 This type of choir is defined by the type of music and its accompanying performance style. Typical repertoire: Music arranged in close harmony. This can come from various traditions, but is often based on popular / musical works. Sheet music: Sometimes used as a learning tool. Almost never used in performances. Part singing: Always. Usually lead, tenor, bass and baritone. Performance style: Usually more static, perhaps with small props and some movement to enhance particular harmonies. These are organisations which exist to perform musical stage shows. And many musicals need a chorus, which is basically a choir with dance moves and theatrical costumes, props and makeup. These are simply small choirs, of perhaps 5-20 members. Often they are part of a larger choir. Usually they are made up of stronger singers, and sing more difficult music from the genre that the main choir offers. These are actually instrumental ensembles, who make music by ringing chimes or handbell - not singing at all.